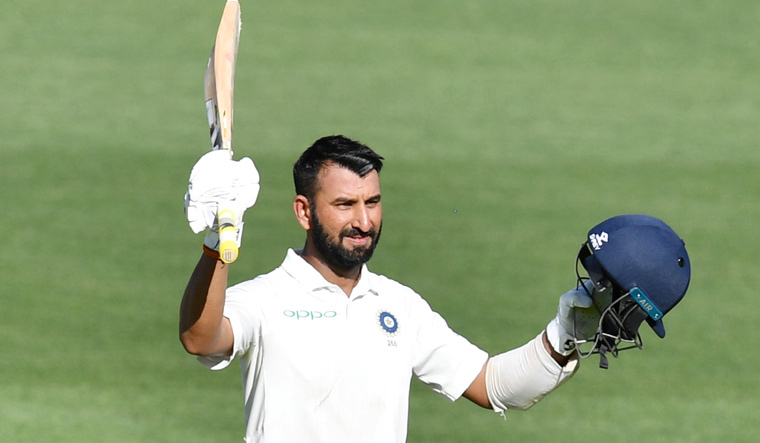 Cheteshwar Pujara rose to the occasion with a maiden century in Australia, pulling India out of a deep hole to a respectable 250 for nine on day one of the first Test at Adelaide on Thursday. Anything close to 250 looked a mountain to climb with India reeling at 56 for four at lunch. But Pujara stood tall amid the ruins to save India from embarrassment on the way to his 16th Test ton. His fighting effort comprised seven fours and two sixes. Post tea, Pujara added 62 runs with R. Ashwin (25) for the seventh wicket. The latter played watchfully, unlike the Indian top-order, and played a great role in this minor recovery.